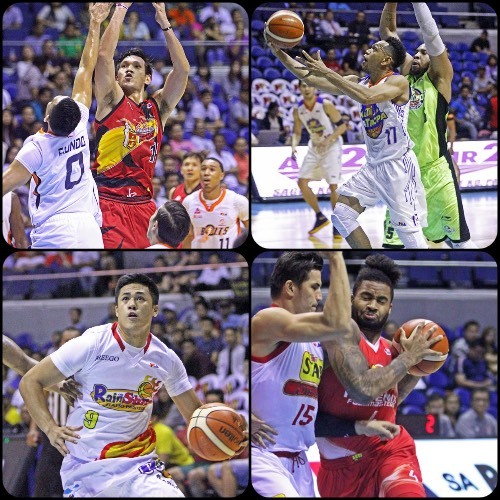 Action from the 2016 PBA Governors’ Cup was wild this past week with TNT, San Miguel Beer, Phoenix, and Rain or Shine coming up with wins a few days ago! Jayson Castro exploded for 37 points and eight assists as TNT KaTropa survived a huge uprising by the GlobalPort Batang Pier to come away with a 122-120 victory in the PBA Governors’ Cup Wednesday at SMART-Araneta Coliseum. Castro scored 22 of his total output in the first half where TNT erected a commanding 23-point lead which they blew after the Batang Pier, led by Terrence Romeo, erased it in the dying seconds. Romeo finished with 33 points and seven assists, falling short in an entertaining battle between the two former Gilas Pilipinas guards. Ranidel De Ocampo scored 17 points for TNT (7-1) including the game-winning jumper that spoiled GlobalPort’s run and put them back on the winning track. Michael Glover finished with 38 points and 18 rebounds, while Stanley Pringle posted 25 points for GlobalPort (3-5) which ended its three-game win streak. Jayson Castro (TNT) - 37pts, 4rebs, 8asts, 1stl, 6 triples, 12/22 FGs. Mike Glover (GLO) - 38pts, 18rebs, 1ast, 1blk, 16/24 FGs. The San Miguel Beermen picked up a crucial victory as they outdueled a game Meralco Bolts squad, 110-106, in an important Oppo PBA Governors’ Cup clash on Wednesday at the SMART-Araneta Coliseum. June Mar Fajardo posted a double-double with 24 points and 10 rebounds while Mike Singletary, making his debut as a temporary replacement for injured Arizona Reid, had 21 points, 20 rebounds and five assists for the Beermen. Arwind Santos added 19 points while Alex Cabagnot scored 18, including two big shots in the clutch. The teams entered the game just half a game apart in the standings. With the win, San Miguel moved up to 6-2, tying Barangay Ginebra and Mahindra for second place. Meralco, meanwhile, dropped to 5-4 but remained in fifth place. Mike Singletary (SMB) - 21pts, 20rebs, 5asts, 1stl, 1blk, 2 triples. Allen Durham (MER) - 34pts, 11rebs, 5asts, 2stls, 1blk, 1 triple, 14/26 FGs. The Phoenix Fuel Masters had to put out a fire in the second half after Star rallied back from 20 points down but still clinched a comfortable 106-93 win at the end of their Oppo PBA Governors’ Cup clash on Friday at SMART-Araneta Coliseum. Import Eugene Phelps had a big night, scoring 45 points and grabbing 17 rebounds for Phoenix, which settled in sixth place with a 4-4 record. Willy Wilson also had a double-double with 13 points and 11 rebounds while Cyrus Baguio and Ronjay Buenafe chipped in with 11 markers each. Star mounted a big 19-0 run in the second half but could not put an end to their continuing struggles as they lost a fifth consecutive game and dropped to 1-7 this conference. Phoenix got off to a terrific start to the game. Their imports carried the load early, with Phelps and Asian import Lee Gwan Hee combining to score the team’s first 14 points in the opening period. Eugene Phelps (PHX) - 45pts, 17rebs, 3asts, 1stl, 2blks, 17/29 FGs. Joel Wright (STA) - 29pts, 11rebs, 3asts, 3stls, 1blk, 1 triple, 12/25 FGs. The Rain or Shine Elasto Painters exploded for 35 points in the fourth quarter as they cruised to a rout of Mahindra, 103-88, in the Oppo PBA Governors’ Cup on Friday at the SMART-Araneta Coliseum. Raymond Almazan led the Elasto Painters with 14 points – eight of those in the fourth quarter – alongside five rebounds and two blocks while Beau Belga added 13 points, eight rebounds and four assists. Rain or Shine had three other locals – Paul Lee, Jericho Cruz and Jeff Chan – finish in double figures in scoring. Lee and Cruz both tallied 12 apiece while Chan contributed 10. They also debuted a new import in Jason Forte, who posted 10 points and six rebounds in under 17 minutes of play. Forte came in from off the bench midway through the first quarter and scored all of his points in the first half. Rain or Shine snapped a two-game slump to improve to 4-4 in the standings while knocking Mahindra, which entered the game tied for second place, down to 6-3. Aldrech Ramos led Mahindra with 17 points while import James White posted 16 points and 10 rebounds. Beau Belga (ROS) - 13pts, 8rebs, 4asts, 1stl, 1blk, 1 triple, 5/11 FGs. Joel Wright (MAH) - 16pts, 10rebs, 2asts, 3blks.